Casio's latest addition to the Exilim lineup boasts 12.1 megapixels and an ultra-wide angle 24mm, 10X optical zoom lens. They also claim it's the thinnest and lightest camera in its class. Other features include: a battery life of 1000 shots, a 3-inch LCD, CCD-shift image stabilization, max ISO 3200 sensitivity, dynamic photo function that coverts JPEGs into a motion movie file and 720p video recording capability at 30 fps. All in a package that measures under an inch thick. 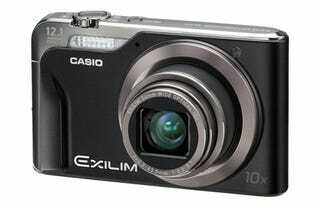 The Exilim EX-H10 will hit stores in July for $300. Hi-Zoom EX-H10. With a thin, compact body and an ultra-wide angle 24mm, 10x optical zoom lens, this new model can take up to 1,000 shots*1 on a single battery charge - making it the perfect travel companion. At the heart of the new EX-H10 is the EXILIM Engine 4.0, which delivers higher image quality and lower power consumption in an even more compact package. The new Engine's Multi-CPU*3 is specifically designed for high-speed image processing. Reflecting Casio's quest for perfection, the new camera provides the best in basic photography functions - beautiful imaging with reduced noise and long battery life for many hours of use. A high-performance 12.1-megapixel model, it also boasts a lens with outstanding optical capabilities - from wide angle to telephoto - and it features a number of Casio's totally original photographic functions. Only Casio could find a way to pack a 10X optical zoom lens, large 3.0-inch monitor and a CCD-shift image stabilization mechanism into such a slim, compact camera body, just .95" thin, convenient for travel. With ultra-wide angle starting at 24 mm (35 mm film camera equivalent) all the way up to 10x telephoto zoom, the photographer is ready for any scene - from huge buildings and other wonders at tourist destinations to distant figures in a landscape. *1. As of June 11, 2009, based on a Casio survey of digital cameras with a 10X or greater optical zoom lenses. *2. When photos taken in accordance with Camera & Imaging Products Association (CIPA) standards. "The development of the ultra-wide angle 24mm continues Casio's dedication to creating digital cameras that are packed with innovative features and new technology," said Toshiyuki Iguchi, Senior General Manager of Casio's Digital Imaging Division at Casio America, Inc. "This new feature gives our camera enthusiasts the opportunity to capture their extraordinary moments in a variety of shooting environments." Casio's original Dynamic Photo function, which creates composite moving images using the camera's own high-speed image processing technology, now does even more. When a moving subject is cut out of a number of images and combined with a different still shot that forms the background, the size of the subject can be changed to suit the background image. Next, the Dynamic Photo video can easily be converted in-camera into a Motion JPEG movie file. Moreover, moving graphics such as hearts and bouquets of flowers are included so that users can have fun decorating their still images using the Dynamic Photo function. Casio not only allows users to have fun taking and viewing photos, but also provides innovative new ways for them to create original images, right on the camera. Casio has reduced energy consumption by improving the circuitry and operational controls and designing a higher capacity battery, enabling the user to take 1,000 shots on a single full charge. The EX-H10 provides a convenient solution for people on the go. It's possible to take 100 pictures every day of a 10 day vacation, without ever needing to recharge, eliminating the need to pack a charger. The long-life battery gives users approximately 11 consecutive hours of viewing on a single charge. The EX-H10 also features a new Landscape Mode for capturing beautiful scenic photography. Unlike earlier landscape photography modes, which enhance the saturation of an entire hue, users can now select between the Vivid Landscape option that uses image analysis to determine and vividly enhance only the most important colors in the landscape or the Mist Removal option that makes weather-affected misty scenes look clear and bright. The new camera will begin shipping to retail in mid July. The EX-H10 will have an MSRP of $299.99 and will be available in black.